While I would guess that probably a grand total of zero people are losing sleep regarding the MyTouch LE RAM “debate,” I figured the above screen shot would settle the matter. For those who you haven’t paid any attention whatsoever to this “issue,” rumors had sparked that the Fender MyTouch LE came with 288mb of ram rather than the current MyTouch3G’s 192mb. Judging by the image above we’re splitting the difference and going with 256mb, same as the Motorola Cliq. So in case you were losing sleep over this, consider the matter closed. Thank you and goodnight, good afternoon. this is understandable, similar to the tp2 it has 288mb of ram but its not all system ram, in fact it is 256mb dedicated to the operations of android and 32mb dedicated to the bios(the process that starts android) combine them and you get 288mb…jsut a word from tmonews forums. we always aim to please. Lmao @David. I love your writing/blogging skillz…so much fun to read from you. I like how you ended this one. Hi don’t have any comments however on the whole ram/rom stuff…just happy to be a t-mobile customer. I hope they add RAM to the HD2 before they release it. With dual snapdragons coming out by June as well as the A9 and even a handset that will be running WM7 in June…adding some ram to the HD2 (which is being released way to late 6 months to late to be exact came out in November I mean come on USA cell carriers talk about wasted opportunity now is the time to compete with Iphone not in the spring and summer when there is a new Iphone running A9) upping the RAM might convince me to buy it rather than wait for a dual snapdragon phone with WM7 native. @David – the my touch le is PVT32A board same as the htc magic that is with rogers. the mytouch3g is PVT32B board which is the same as the google ion and only has 192mb of ram. the 32A boards are almost identical to the HTC Hero Motherboard except for the camera. 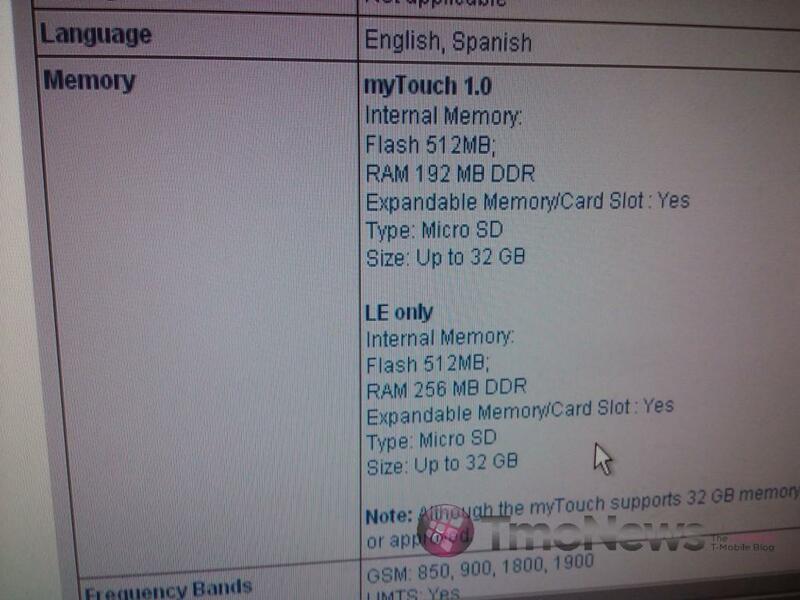 The new Mytouch LE once rooted will be able to run the hero room almost natively because of the 288mb of ram. (same ram as the hero)and the sense UI should be able to be run flawlessly. Nah, TMO just made a mistake with their published RAM specs – when using an LE with Connectbot installed and punching in cat /proc/meminfo I show 195844kb memtotal, where on a G1 or myTouch the same thing would show approx 99040kb memtotal. The difference is approx 96MB. 288-192=96. So there, nerd up! Impressive, most impressive. I’m speaking to you, Mr. Danza. I had a discussion with my boss over this very issue. Although, being the biggest geek in my store, it was a one-sided conversation. I just couldn’t imagine HTC making a whole new motherboard so it could have more RAM than the 32B but less than the 32A. I knew it really had to be 288 megs, even after seeing the internal document with the specs. Another document floating around showed the Behold II also with 256 megs of RAM. If that’s true, Samsung employs some of the worst coders on earth. At any rate, I now have to debate picking up the myTouch 1.2 and sticking with Android, or going with the HD2 and enjoying one of the most powerful phones on Earth. Decisions, decisions. I stopped by my local T-Mo store last night, to get a glimpse at the Fender. They had it, but wouldn’t turn it on. I was asking for confirmation about memory, and they kept talking about 16GB, when I kept asking for RAM. They finally said with full confidence that it is exactly like the original MyTouch. When will T-Mo train their sales folks? This was the same store that the sales manager who sold me my G1 instructed me to save all contacts on my SIM card for my G1. In hindsight, that really pisses me off. They had no concept about how GMAIL works.